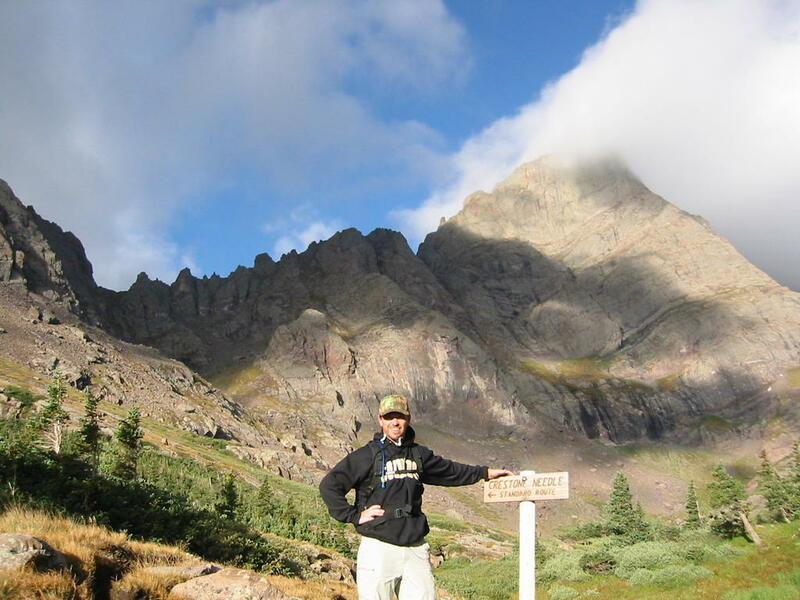 A blog about weekend mountain climbs, trail hikes, mountain bikes, and hunting trips by your average dude. Donald Alton Lyman Sr. was born in Salt Lake City, Utah on March 14, 1942. Clifford, Anna, and Don lived in Monticello until Don was the age of two. After Clifford died accidentally, Anna later remarried. Anna and her second husband, Glen W. Jones, raised and loved Don until there passing. When Don was a child the family moved around awhile as Glen was a civil engineer. While living in Salt Lake, Don's first job was a paperboy. He would later attend Grand Junction High School until 1959.When Don first met his sweetheart Linda Fowler he would walk from Monticello to La Sal to see her. While they were dating, he drove a white 1956 Ford with "Wild Child" in old english letters on the back.. He always loved working on cars and driving fast. In fact, he jacked the back end of his car up by putting 2x4 blocks under the back springs. Don and Linda were married on May 24th, 1963 in La Sal Utah at the LDS church. Don worked at the Needles Overlook as a high scaler in the early 60's. He later hauled ore for Arthur (Hardwater) Knight. He then worked in Aspen as a bartender, busdriver, and cabbie while living in Carbondale Colorado. His parents Glen and Anna lived on the Crystal River and Don's favorite mountain was Mt. Sopris. Don and Linda's first child, Don Jr. was born in Glenwood Springs CO on December 23, 1964. Then they had Veronica on November 11, 1966 in Telluride CO in the doctors office. Don was mining with his father-in-law Elmer Fowler at the time. Their third child Larry was born on August 25th, 1970 in Grand Jct. Don, Linda, and family lived in Grand Jct. for about twelve years while the kids were in school. 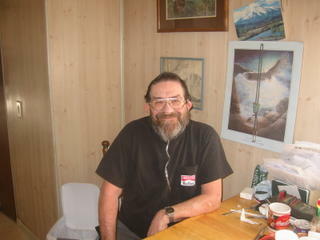 Don worked as a mechanic, truck driver and bartender. 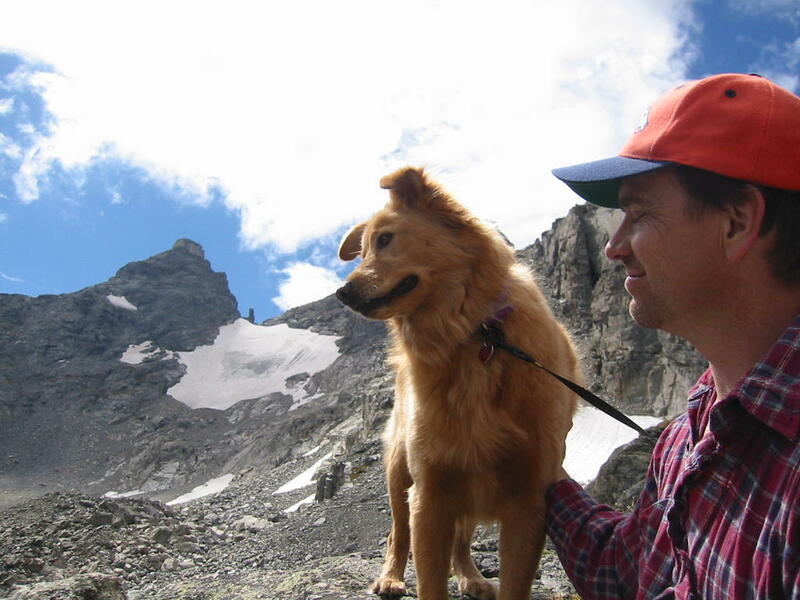 He enjoyed camping and fishing in western colorado and eastern Utah. He also enjoyed watching his children play sports. In 1982 they moved back to Moab. Don was working for Hardwater again hauling ore. For the next ten years he spent his free time exploring and 4-wheeling the Canyonlands with Linda. One of his last jobs was his favorite. He was a river runner for a rafting company. In 1991 Don met Joanne Johnson. They spent time out and about before Don got sick. They travelled together to Colorado and Nevada. For the last ten years Joanne has taking care of Don. Bringing him meals and conversation everyday. She was his constant companion and best friend. His hobbies included collecting coins, comic books, marbles, and eagles. He loved the martial arts and watching action movies. One of his favorite actors was Charles Bronson. After he had stopped mechanic work, he passed his time by obtaining an electronic certificate from Mesa State College and an accounting certificate from an an online college. His favorite pasttime was building and repairing computers. On September 27th Don Lyman passed away from a long term illness. We are grateful he no longer has to struggle to breath. He was welcomed home by his loved ones on the other side. We will miss his conversations at the stove. Until we meet again, Godspeed. 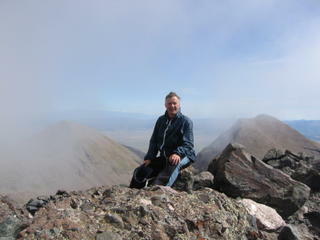 You thought I quit hiking 14ers for the year, because I did not post last week, didn't you? No, no, no my friends. I just had prior commitments that forced me to stay in the city. This week I am on call at work, so I only had Saturday as an option. Saturday is the sabbath, so the pager won't beep all day. Since I feel most spiritual in the mountains, I reasoned that a quick trip to Torreys and Grays was in keeping with the spirit. I spent seven hours last night at the Benny Hinn crusade at the Pepsi Center and didn't get to bed until 1:30 am, so I wasn't sure I would make it up in time. Luckily my gumption was up when the alarm went off at 6am. I quickly threw some lunch in my day pack and took off. Six stop lights down the street, I realized I had forgotten my camera. What to do? Of course with the aspens in full color, I had to turn around. 20 minutes lost. I arrived at the trailhead at 8:30 am and headed up. Using the Colorado Scrambles book as a guide, I easily found the trail to the Kelso-Torreys saddle (photo 1). There are roughly four pitches that could be classified as Class 3 on the way up. I have a picture of each here in order (photos 2,3,4). All can be bypassed, but what would be the point right? I like the fact that you can make it as hard as you desire. The last pitch over the knife edge and gray-white cliff is the most exhilirating (photo 4). I even heard people cheering from the Grays trail below! The rock is loose above this cliff and a bit annoying. Luckily there isn't too long a stretch of it. Staying to the far right or left in this gully is your best footing. 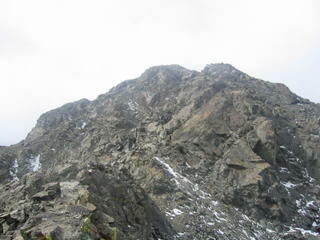 I summitted in just under two hours from the truck! Joining the masses at the top, I asked someone to snap my picture. Then I had a decision to make. 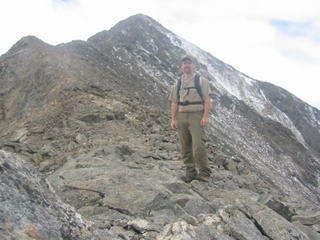 Do I head back down the ridge for more fun, or trudge over to Grays to bag another 14er. My goal is not to summit all the 14ers, so I should have headed back down but Grays beckoned me to check him off the list anyway so I headed on over. These fourteeners are getting easier. I made it over to Grays in no time and had a sandwich. Well, not really a sandwich because I left my cheese on the counter at home and we had no lunch meat. It was really just a bagel. The view from here is very cool. 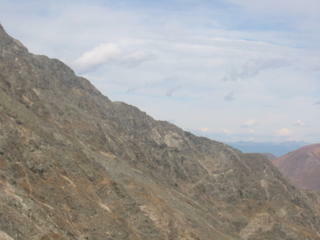 You can see Pikes Peak, Evans, Longs, Quandary, and the Lincoln group. Because we had company in town (Michelle's family), I decided to make time back to the truck so I could get back to Aurora by early afternoon. I hoofed it down the trail and was back at the truck, completing the loop in just under 3:30 hours. Not a bad time for me... but I think the record is 2:20. 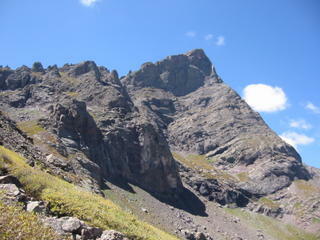 While the Kelso ridge doesn't quite match the Crestone Needle, it is a very fun scramble indeed. I could not quit smiling and whistling the whole way up. 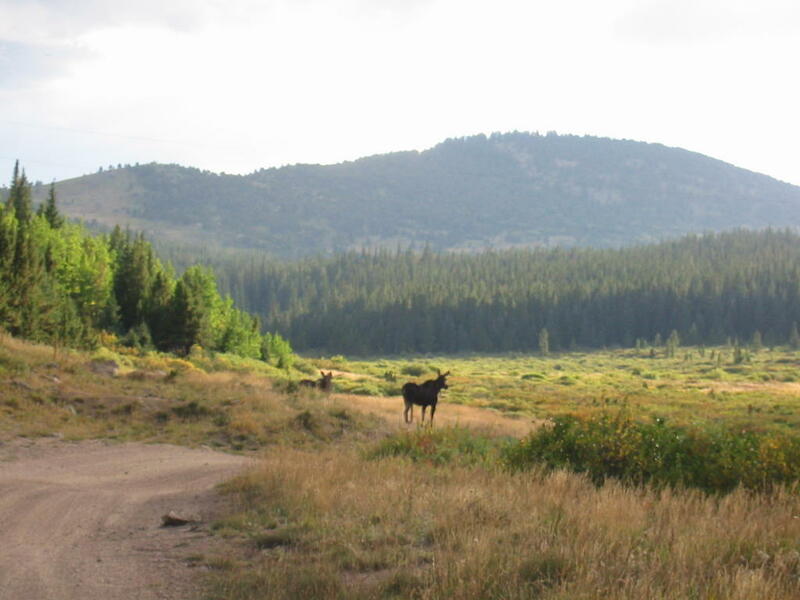 Plus its a lot closer to the house than the Sangre De Cristos. 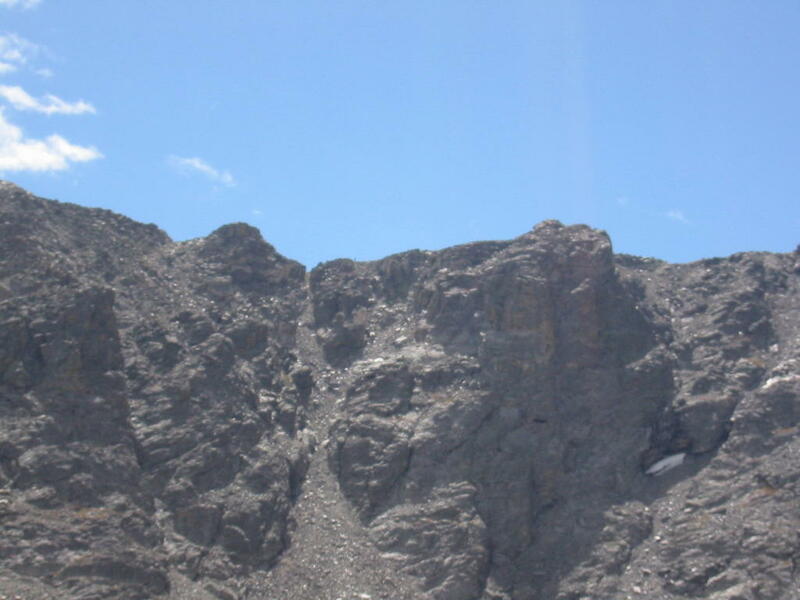 This week I finally realized my summer goal: climbing the Crestone Needle. 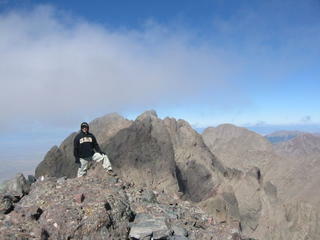 Hiking to the top of various fourteeners this year left me with a desire for something more challenging. After doing much reading and studying I set my sites on the Needle. It was sufficiently challenging, yet still Class 3. I think I prepared for it the right way. 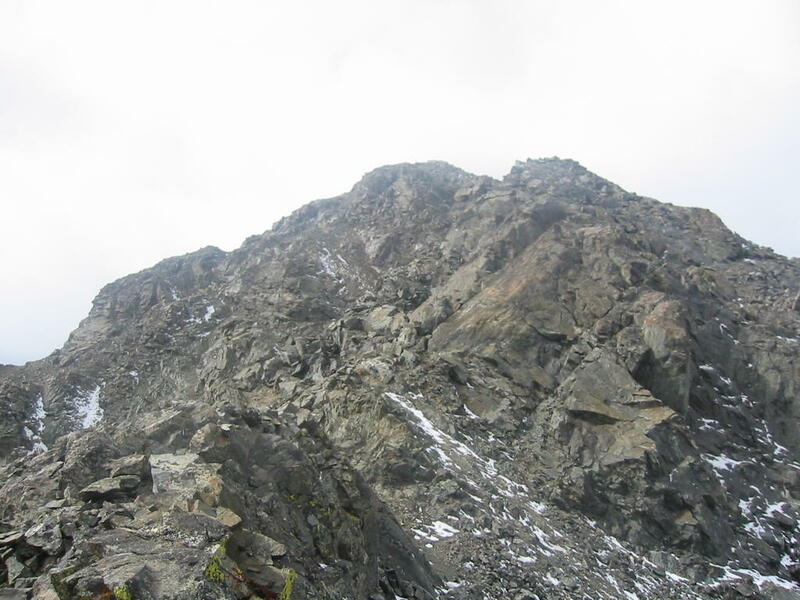 First was a probable third class climb on Mount Peale. Then last weekend a bit harder climb on Apache Peak. But the biggest boost was that my good friend Nick agreed to join me! Originally, we wanted to complete two more sections of the Colorado Trail this year, but the outrageous cost of gas, the need for two vehicles, and a late meeting at work on Friday combined to force us elsewhere. I'm glad the mountain god played us this way. On the trip down to Westcliffe we encountered the often bemoaned traffic north of Colorado Springs. I don't understand the slowdown there. Even with that we arrived at the trailhead with plenty of daylight. The various trip reports about the 4wd road here range from accurate to exagerated. The first 1.5 miles is rough and I had to put my F150 in 4 low, but it is far from the roughest 4wd in Colorado. We found an excellent camping spot on the flats between the private property and the Rainbow trail. On the trip up we picked up a hitchhiker named Oova. He said it was the most radical 4 wheeling he had ever done. He was planning on climbing Humboldt Peak the next day. Nick and I set up camp, roasted some hotdogs, and toasted his new job with a six pack. The next morning we set out on my Yamaha Kodiak ATV on up the trail. It does get a bit rougher in spots, but there were plenty of SUVs and trucks at the upper trailhead. I am glad we had the ATV as it shaved about 7 miles off of the hike. We hike up to the South Colony lakes and then continued on up Broken Hand pass. The clouds were pouring over the top of the needle and we saw a climber on the Ellingwood Arete. We weren't the first of the day up to the pass, but we were the first headed for the needle. 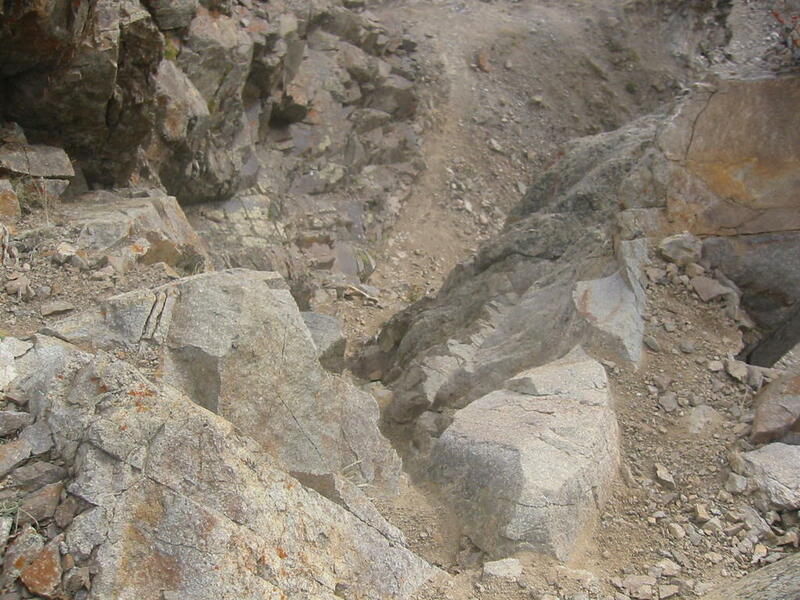 The new trail that contours over to the couloir has one spot that was a little challenging. This gave us a taste of what was to come. 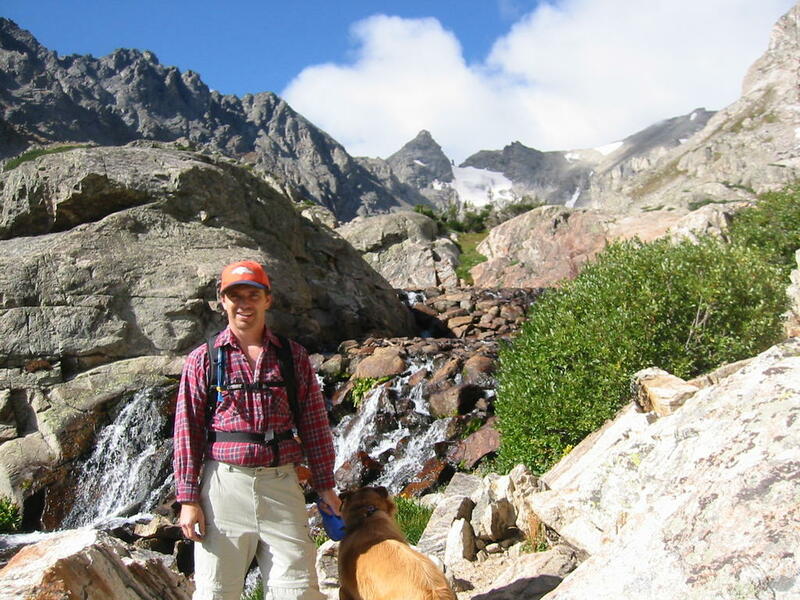 The climb up the west couloir was very fun and not too challenging until we got to the traverse to the east couloir. This was a bit trickier, but with Nick's advice I made it fine. Nick gave me two pointers to work on in my climbing. First, use your legs primarily and keep your body vertical... not against the rock. Second take steps of between 6 and 12 inches up. Your view changes quite a bit if you take these small moves. The climbing from the traverse to the top was just way too much fun. The rock is conglomerate with many solid holds. We made the trip from the lakes to the top in 2 hours and 20 minutes! At the ajax we had the mountain to our selves. 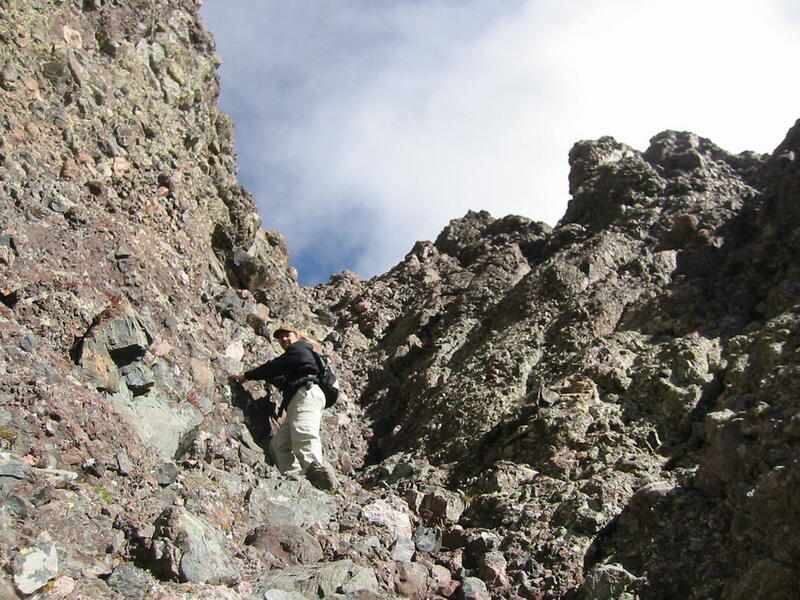 Nick examined the traverse to Crestone Peak and agreed that we could make it... but not this day and not without gear. We left it for our next trip. From the top you have a superb view of the Great Sand Dunes national monument. 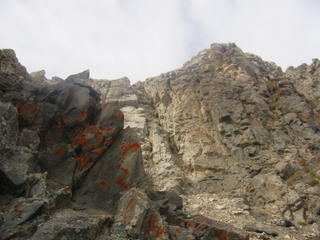 On the way down we encountered three other climbers and two marmots doing the nasty. We stopped and enjoyed the beautiful afternoon for awhile before continuing the descent. It was such an awesome day! This is by far the best trip in all my years of hiking. On the way back to the camp, Nick drove the ATV. It was his first experience on it and he had fun. I think he might even buy one... nah! After hauling it up the trail to camp we decide it was better to ride it all the way down to the bottom. By the way, there were quite a few hunters in the area of Rainbow Trail. It was opening weekend for muzzleloaders, and we heard two shots on Sunday morning. After climbing to San Isabel Glacier, we still had plenty of daylight so we decided to explore the area to look for possible deer hunting spots. First we looked around the Gold Hill Road area. It looks like public ground and private ground in this area is a patchwork that could be quite confusing. The terrain is also very steep, so only dedicated hunters need apply. 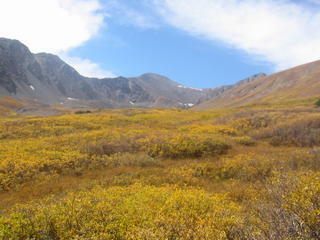 Then we proceed to FR 298 toward Arapahoe Glacier. Much of this area is heavily wooded and some of it is owned by CU, which doesn't allow firearms; thus no hunting. Just before the campground we discovered an easy 4WD trail that we decided to take into Nederland. This decision turned out to be awesome. 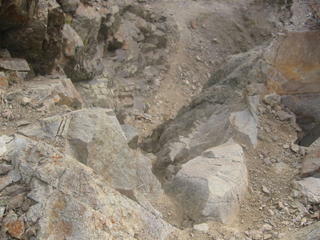 The trail was not too challenging and requires only high clearance not 4WD. A good thing since we were in Michelle's Cherokee. After we passed another campground, we topped a hill and spotted our first animals! No not deer, moose! A cow and a calf were proceeding across the valley. Further down the road we spotted a cow elk. I don't know if there are deer in this country, but 29 and 38 are the only units with deer tags left. I think a bit more scouting is in order. The decision making process is far more complicated than you might imagine. Far more so than the preparation, which is by now routine. Where to go, where to go, where to go? That is the tough one. Here are the motivators behind this weekend's choice. First, I wanted to do a bit of scrambling to prepare myself for a trip to the Crestone peaks. Second, Dalton wanted to scout game units 29 and 38 for deer. Third, I wanted to take our dog Gracie on her first hike. Fourth, it is Labor Day and gas prices are outrageous. Put all of this into your hand-held super neural net gps computer and it spits out Navajo Peak. Cool. 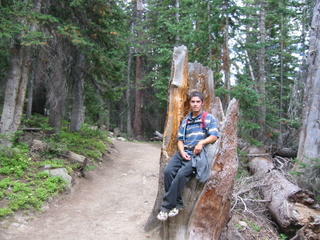 Bonus because I had not hiked in the Indian Peaks before. 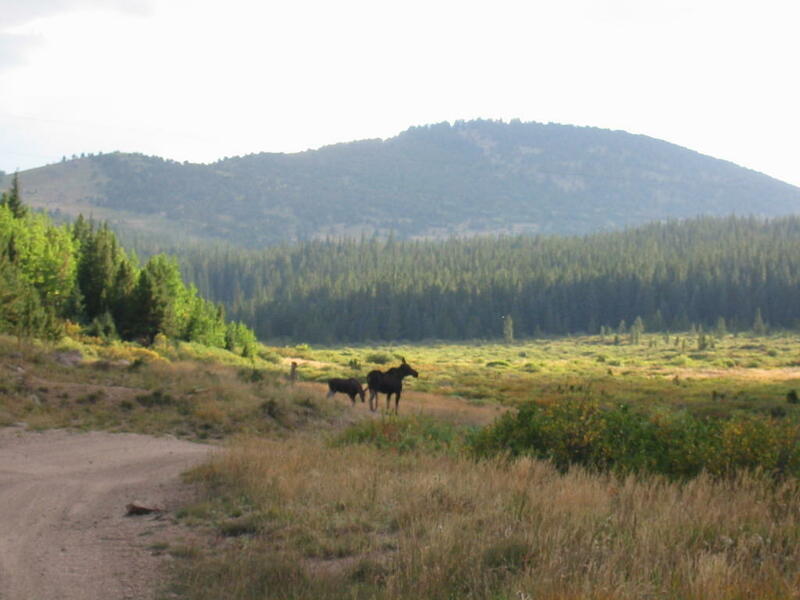 So we set off for the Long Lake trailhead at 6 AM and arrive at the trailhead by 8:30. The parking lot is already full due to the holiday, so we have to park farther down. The price of a dmission was a bit of a shocker: $7! Oh well, cheap as a movie and much more fun. The hike from Long Lake to Lake Isabel is flat and easy. 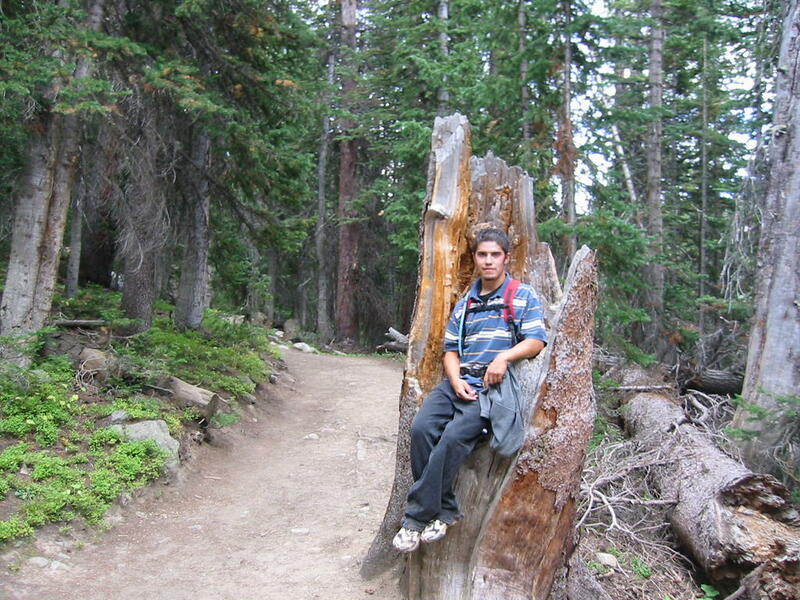 A good primer for Dalton who has been burned by hiking with Nick and I before. We tell him it is easy and it turns out to be a mini-epic. From Lake Isabel to the upper unnamed lake is a bit steeper, but very beautiful. You are surrounded by those awesome peaks. You pass by small waterfalls and through marshes and by big boulders. This brought us to a decision point. To go according to Dave Cooper's "Colorado Scrambles" book (which is highly recommended by the way) you leave the main trail and head for airplane gully. I wasn't sure how tough this trail would be for Gracie and I was hesitant to burn Dalton out on his first hike with me in awhile (given his history with Nick and me.) 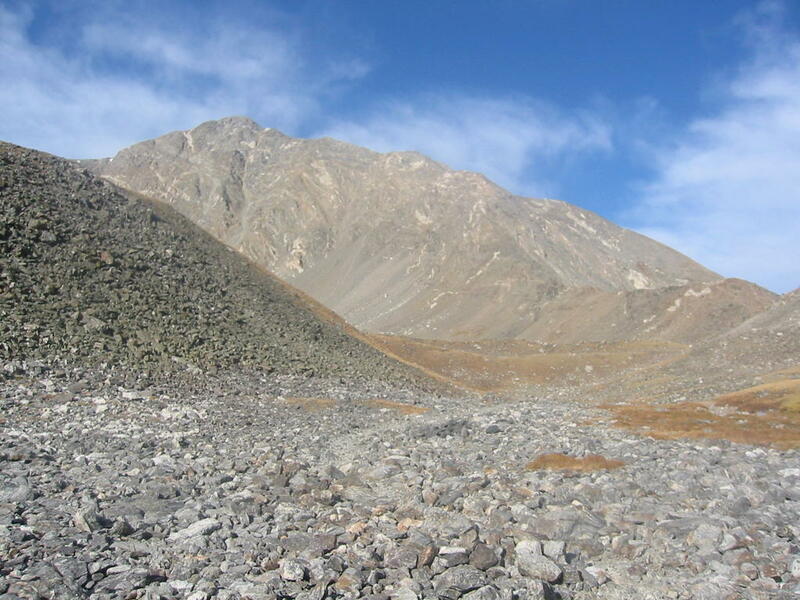 So we decided to continue on the trail to the San Isabel Glacier. The trail at this point becomes a much steeper class 2 pull. Gracie was huffing and puffing and Dalton was starting to get preturbed. But I finally felt like we were really hiking! As we arrived at the glacier, Dalton had had enough hiking and any farther was no place for dogs. I, however, was just getting juiced. I decided to scramble up the Apache couloir and then make a decision from there. The approach to the couloir takes you through a maze of rocks and boulders pushed down by the glacier. 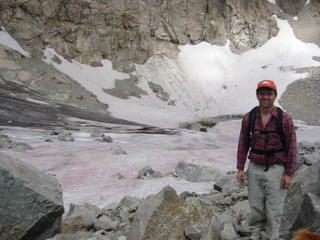 Then I had to tip toe across a snow field to get to the mouth of the couloir. I think an ice axe purchase is in my future. 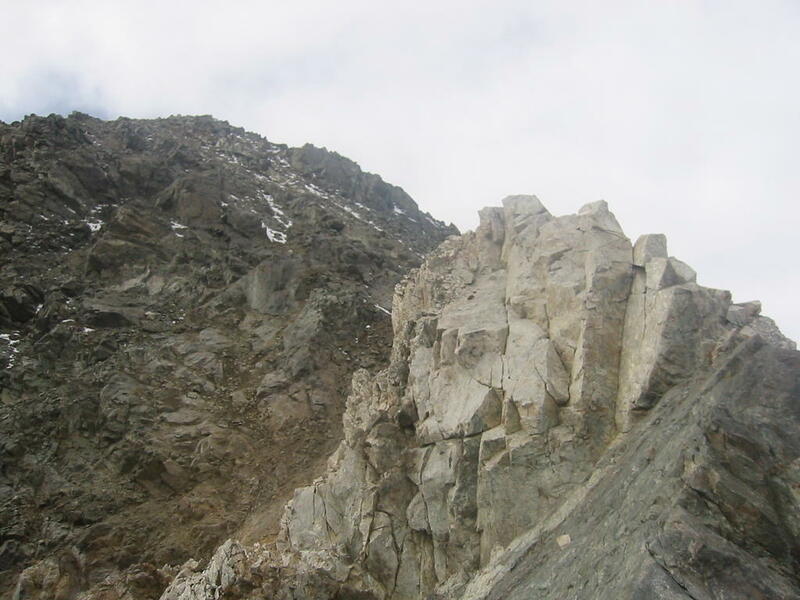 The couloir itself is full of loose rock, but otherwise is not too scary. 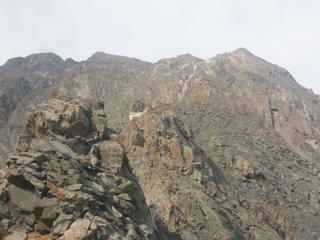 I clung to the right hand side of the couloir for most of the ascent. 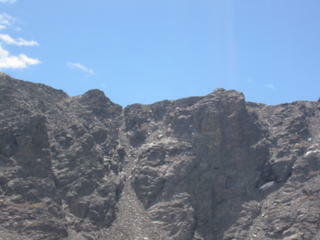 As I reached the top of the Apache Couloir, I was filled with exhillaration. This scramble was a bit tougher than my outing on Mount Peale and a good test for me. I didn't want to leave Dalton for too long and the approach to Navajo Peak looked from here to be quite challenging and kinda far away. Plus I was thinking about the descent as well. So I decided to save it for another day and just do Apache Peak instead. The climb up from here involved no scrambling. The climb back down the couloir looks steep and is steep, but with concentration not too technical. I even picked up some rock samples for my collection. Arriving at the snowfield, I decided a little glissading was in order. Fun all the way down! As I returned to the glacier, I found Dalton taking a nap. We had lunch and then made the return trip to the jeep. By this time there seemed to be hundreds of people on the trail! I think 9 miles is about Gracie's limit because she was cramping and stumbling at the end. Thus ended the first half of our day, I will post the second half: deer scouting next.